Urbanization can cause detrimental changes to the hydrology of natural features such as wetlands, woodlands and watercourses. Toronto and Region Conservation Authority (TRCA) and Credit Valley Conservation (CVC) are working together to better understand these processes and mitigate the impacts. Note: This web page provides information about feature-based water balance for the protection of hydrologically sensitive natural features. For information about requirements within Well Head Protection Area for Quantity (WHPA-Q) zones to maintain recharge under the CTC Source Protection Plan, please click here. Hydrology is critically important to a natural feature’s ecological composition, structure, and function. It directly affects the physical and chemical properties of the feature, which are important factors in determining the kinds of plants and wildlife that can be found there. 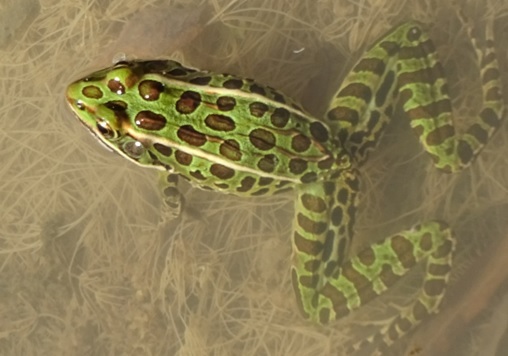 For example, hydrology is one of the main factors influencing whether or not amphibians are able to use a wetland to breed. Changes in hydrology as a result of urban development can impact the amount and quality of water reaching a natural feature, as well as the location of different flow paths. This can lead to serious problems for natural features, and can also threaten public and private property through vegetation shifts, altered habitat conditions, flooding, and erosion. Urbanization can alter hydrology in a number of ways. An increase in impervious surfaces such as pavement and rooftops within a natural feature’s catchment can reduce the amount of water that seeps into the ground or evaporates into the air after it rains or snows. It also causes more of the rain to flow over the land as runoff, generating much more water during storms than before the area was urbanized. Depending on the form, design and construction of a development, some natural features may become wetter, while others may become drier as water is either diverted toward or away from the natural feature. Developments that extract or divert groundwater away from natural features can also be problematic. Measures to match the quantity and quality of water that reaches a natural feature become necessary when it is likely that a proposed development will impact its hydrological functions. A water balance analysis is required in order to demonstrate that the hydrology of the feature will be maintained once the development occurs. TRCA and CVC have developed guidelines to help protect the hydrology of natural features, and have initiated a research study to better understand when significant adverse impacts from development are likely to occur. TRCA and CVC have developed guidelines for addressing the hydrological impacts of urban development and groundwater extraction proposals on natural features, including wetlands, watercourses and woodlands. These guidelines were incorporated into the updated Stormwater Management Criteria of both organizations in 2012. Measures to protect the existing water balance of natural features are necessary when it is likely that a proposed development will impact its hydrological functions. A water balance analysis is required in order to demonstrate that hydrological regimes and hydroperiods will be maintained in the post-development scenario. The guideline describes the steps required to undertake a water balance analysis for wetlands, woodlands or watercourses. These steps include scoping the water balance analysis, establishing baseline conditions, developing a hydrologic model calibrated with baseline data to evaluate the post-development scenario, applying mitigation measures, and monitoring to verify the results of the analysis. Further guidance is being developed around various aspects of this guideline to clarify and streamline the application process. This more detailed guidance is first being developed around wetlands, with the intent that this will help inform the guidelines for streams and woodlands as well. A literature review of existing studies of the effects of urbanization on wetlands and associated hydrological thresholds (e.g. percent impermeable land cover in a catchment). A risk evaluation tool outlining the development scenarios in which a water balance analysis is necessary for the protection of natural features, and the scope of analysis appropriate to the sensitivity of the feature and the type of development. A monitoring protocol outlining TRCA’s requirements for collecting baseline (pre-development) and post-development hydrologic data. A hydrological assessment tool, and documentation, to analyze pre-development hydroperiod data and create hydroperiod targets to evaluate the impacts, if any, of proposed developments. An evaluation of hydrologic models (EPA-SWMM, PC-SWMM, MIKE-SHE, HEC-HMS, Qualhymo, PRMS-GSFLOW, HSPF, Continuous Otthymo) calibrated using wetland monitoring data to provide proponents with more guidance around the modelling component of wetland water balance analyses. Tied to the above, a forensic analysis of a previous water balance study where results diverged greatly from model predictions to identify shortcomings in modelling approaches. This information will be included in future modelling guidance documents. An evaluation of existing water balance mitigation measures in TRCA jurisdiction to learn from past approaches. A wetland water balance research study and analysis of data to determine the best approaches for instrumenting wetlands to characterize baseline and post-development hydrology. The study and additional objectives are described below. 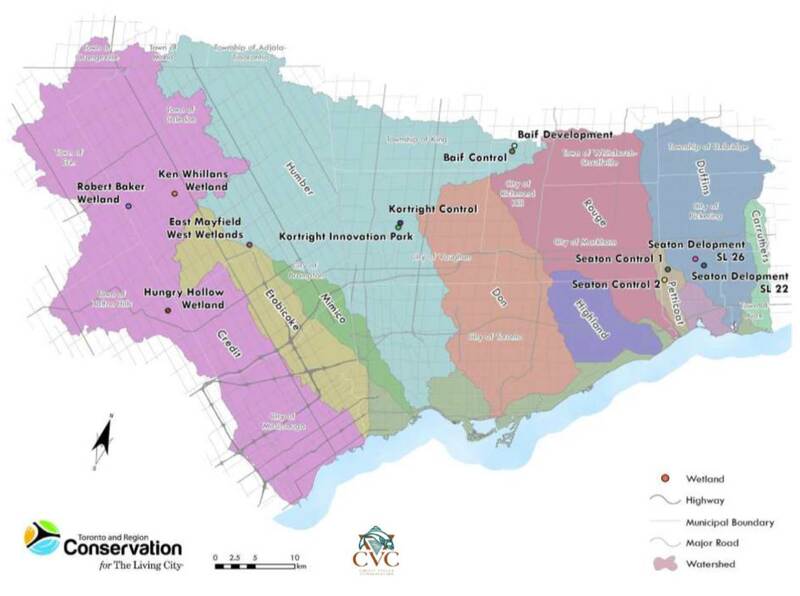 TRCA and CVC initiated a long-term research study in 2012 to better understand wetland hydrology and how urbanization drives changes in these natural systems. Currently, our ability to achieve water balance objectives for natural features is limited by the availability of sufficient science, monitoring protocols, effective modelling, practitioner training, and adequate criteria. The purpose of this project is to advance our knowledge and understanding of hydrological requirements of natural features to protect the long-term ecological health of these features through the land development process. This understanding will lead to improved consistency, efficiency, and efficacy in reviewing development applications affecting the water management of natural features. Due to the complexity of the project, the study team has decided to phase the study, with an initial focus on the study of wetlands. The intent is that other natural features, including watercourses and woodlands, will undergo detailed study in later phases. This project will improve our understanding of wetland hydrology in Greater Toronto watersheds and the sensitivity of different wetland communities to changes in hydrology. The main goal of this initiative is to assist with future land-use planning and impact assessment, but secondary benefits may result for wetland restoration initiatives and evaluation of wetland integrity in a watershed. A map of study sites is shown below. The intent is that data will be collected over a long period (10+ years), but will be used in support of water balance analysis processes currently being undertaken for urban development and water extraction approvals. The data will provide valuable information about the hydroperiod conditions associated with certain wetland communities that are both common and vulnerable to hydrological changes. To calibrate various water balance models to determine which models are appropriate to which applications, and how much data is sufficient to adequately represent actual wetland hydroperiods. Dr. Andrea Bradford at the University of Guelph and her graduate student are partnering with TRCA on this component. To allow us to better understand the hydroperiod of sensitive vegetation communities so that this information can be used as a surrogate where information is lacking, such as when inadequate lead time is available for collection of sufficient baseline data. Over a longer time period, an additional goal is to pair hydrological data from this project with other long-term terrestrial monitoring data to help address a number of information gaps we have with regard to wetland functioning across our jurisdictions. The work on wetland water balance completed to date will help inform the development of a broader Ecohydrology Program at TRCA, led by the Research and Climate Programs Team. The goal of this program is to provide additional tools and guidance needed for the protection of woodlands and streams from stressors related to urbanization and climate change, including the completion of water balance analyses, understanding the implications of predicted shifts in winter hydrology, incorporating vulnerability assessments and connectivity modelling, setting in-stream flow targets, etc. Wetlands will continue to be an important area of research in this program.